Effective family research requires some understanding of the historical events that may have affected your family and the records about them. Learning about wars, governments, laws, migrations, and religious trends may help you understand political boundaries, family movements, and settlement patterns. These events may have led to the creation of records that mention your ancestors, such as land or military documents. Your ancestors will become more interesting to you if you learn about the events that shaped their lives. For example, by using a history you might learn about the events that occurred in the year your great-grandparents were married. 1517: Protestant Reformation. The first significant non-Catholic religions begin in Germany. 1563: Council of Trent. Catholic priests are ordered to start keeping baptism and marriage records. 1583: Catholic areas begin using the Gregorian calendar. 1608-1618: Protestant German State of the Protestant Union. 1618-1648: Thirty Years' War. Many records are burned. 1622: The Pfalz suffers great destruction in the war. 1648: Peace of Westphalia ends Thirty Years' War in the Holy Roman Empire. Many borders are shifted. 1653-1654: Sweden started Sweden-Bremen Wars over the claim that Bremen was to be ceded to Sweden. 1683: The first permanent German settlement in the United States was founded at Germantown, Pennsylvania. 1700: The last German Protestant areas finally change to the Gregorian calendar. 1709: Large numbers of emigrants, called Palatines (Pfälzer), leave the Pfalz region of Germany for England and America. 1722: Austro-Hungarian monarchs begin inviting Germans to settle parts of their empire. 1742: Prussia (Preußen) annexes much of Silesia (Schlesien). 1763: Catherine the Great begins inviting Germans to settle in Russia. 1772: First Partition of Poland: Prussia annexes West Prussia. 1792: France starts civil registration west of the Rhine. Some church records are interrupted. 1793: Second Partition of Poland: Prussia annexes Posen and parts to the east. 1795: Third Partition of Poland: Prussia annexes most of the rest of today's Poland, including Warsaw, Bialystok and parts of Lithuania. 1795: Napoleon begins to conquer most of Europe. Civil registration introduced in the parts of Germany held by France. Jews treated as citizens, encouraged to adopt fixed surnames. 1806: Europe reorganized under Napoleonic design. "Holy Roman Empire of the German Nation" no longer exists, replaced by Austrian (later Austro-Hungarian) Empire and various kingdoms and principalities across Germany. Prussia is defeated; loses almost all territories earlier acquired from partitions. 1812: Emancipation of Prussian Jews. Surname adoption mandatory. Jewish vital records kept by local governments. 1814: Napoleon weakens. German states begin to reorganize under the leadership of Prussia. 1815: Congress of Vienna effectively sets most of Europe's national boundaries for the next century. 1828: Patronymic naming is abolished in Schleswig-Holstein (then part of Denmark). 1833: Prussia offers citizenship to some of Posen's Jews. 1848 German Revolution. Emigration to the United States increases. 1850: The Hamburg passenger lists begin to document the origins or places of residence of Europeans leaving for the Americas, Africa, and Australia. 1871: Franco-Prussian War ends. Alsace and part of Lorraine come under German rule as Alsace-Lorraine. German Empire established as a single nation state. 1874: Prussia introduces civil registration. 1876: Civil registration is required throughout Germany and begins wherever it is not already in effect. 1914: World War I begins. 11 November 1918: World War I ends. (Alsace-Lorraine is returned to France. Northern Schleswig-Holstein returned to Denmark. Posen and parts of Silesia and West Prussia are ceded to Poland. Northern tip of East Prussia goes to Lithuania. 1 September 1939: World War II begins. 7 May 1945: World War II ends. East Prussia divided between Poland and Russia. All other German territories east of the Oder-Neisse line ceded to Poland: Farther Pommerania (Hinterpommern), West Prussia, Neumark region of Brandenburg and Silesia come under Polish administration. “The past actually happened, but history is only what someone wrote down”, said A. Whitney Brown. From a genealogist’s point of view, it is wonderful when events were recorded and sad when they were not. German national history is eventful, to say the least. Some actions had a major impact on the lives of our ancestors. Following are a few developments which altered the political and social landscape of Germany. To gain a more in-depth picture of an event or an area, local histories should be consulted. The printing press facilitated the spread of ideas swiftly. New ways of communication opened up and attempts were underway to translate the Bible into the language of the people. Martin Luther is one who undertook such a feat. His 95 theses why the Catholic Church should be reformed launched the first political and social revolution in Germany. In 1525 inflamed through some pastors’ interpretation of the Reformation, the people of Thüringen, Schwaben and Salzburg sought for more equality. Up to this point they were subjects to feudal lords. The revolt helped to even the way to landownership as well as establish a new religion, Protestantism. The serfs established 12 articles (known as the rise of the common man) and demanded basically what much later the Declaration of Independence formulated thus: “We hold these truths to be self evident that all men are created equal that they are endowed by their creator with certain unalienable rights that among these are life, liberty and the pursuit of happiness”. The serfs had to wait centuries before they could enjoy such freedoms. The Catholics had a stronghold in Germany as seen on this map. Protestant groups fought for equal standing and in 1555 were granted comparable rights with the Catholics. An individual, however, was not in a position to choose his religion. He was dependent on his sovereign lord who chose the preferred faith for his land. With the Peace of Augsburg in place, one would think religious strife ceased. This was not the case, as this map shows. In the 1500s we see record keeping in the parishes. This was not mandatory. The priests kept records of their ministrations. We see marriage entries, then births and deaths. Around 1550 it became fashionable to celebrate someone’s death in a more elaborate way. This trend started with the male nobles and wealthy citizens. At their funerals so called “Leichenpredigten” (sermons) were given. These described the life and professional career , the ups and downs in the life , marriage and family of the deceased. This practice spread to cover female and ordinary citizens’ funerals and became a widespread literary product. The printing and distribution of Leichenpredigten were discontinued after 1750. The religious strife did not cease because it became a political issue. The Czech nobility was under the impression that they had been granted religious freedom, which was not the case. Their German overlords favored Catholicism. The tensions came to a peak. When the Catholic envoy came to support the Church’s views, the Czech delegates tossed these men out the window. The Defenestration of Prague on May 23, 1618 produced serious consequences. What seemed to be a conflict between Protestantism and Catholicism was in reality a war between Catholic France and Catholic Habsburg for supremacy in Europe. Four wars were fought to solve this conflict. Sweden, Denmark, France and Bohemia were the nations to engage in these wars. They were fought on German soil and brought much devastation. See Thirty Years' War. The destruction lasted one human life time and two to three generations to rebuild. 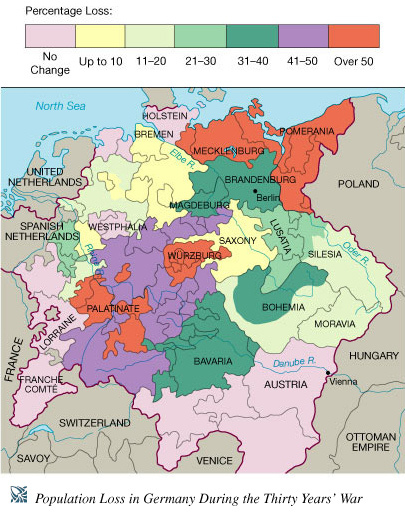 Before 1618 sixteen to seventeen Million people lived in Germany, after 1648 four Million were left. Example: Württemberg was especially hit hard. 450,000 inhabitants lived here before the war, after the war 100,000 were left. It took 10 years to rebuild the population. Record keeping at this time was non-existent in some parishes or occurred in a neighboring parish because of the lack of priests. Destruction did not just come through wars, but through hunger and disease (plague) as well. Devastation occurred also through overzealous interpretation of the scriptures. Exodus 22:18 “Thou shalt not suffer a witch to live” gave authorities the right to put those to death whom they deemed possessed with witchcraft. Men and women with knowledge of enhancing or healing herbs, once a highly regarded craft, were especially targeted, accused as devil’s advocates and put to death. Germany with 25,000 such cases was in the lead among Europeans. After 1648 land became available. People moved eastward to open up new frontiers. Couples married at a younger age. Others had to flee from further religious conflicts. The first larger emigration to North America began when the Concord delivered Germans to Pennsylvania in 1683. People from the Netherlands fled religious disputes and settled in the marshy areas of Schleswig-Holstein in Northern Germany. They built dykes and established milk processing stations, travelling as far as West Prussia to settle along the Vistula river. See this map. Still others followed an invitation by Catherine the Great to settle in the Black Sea regions. This map shows German areas from which people emigrated in large numbers during the 17th and 18th centuries. In quick succession developments occurred which influenced life in Germany to a great extent. The state of Prussia from a relatively small entity annexed most of the Northern German states by 1871. The Industrial Revolution in England had a tremendous impact on the rest of Europe. The French Revolution brought the ideas of “egalite, fraternite and liberte” and Napoleon’s occupation of German territory along the Rhine and northern parts aroused in the German soul for the first time the thought of nationalism. Moreover, Napoleon inspired the Confederation of the Rhine, dissolved the Holy Roman Empire, reduced the German states to 39, introduced the French Calendar and administrative measures and inspired the March Revolution of 1848. The Revolution of 1848 was unsuccessful. The citizens of Germany tried to achieve national unity and to obtain a political voice. The aspired changes failed because Austria wanted to change the political landscape back to pre-Napoleonic times and Prussia was too fainthearted to go through with any changes. After the failure to achieve political union, many prominent Germans faced prison time if they did not escape to America or Switzerland. A quarter million people found a new home in America and had quite an impact on the cultural and technological developments of this country. Hamburg and Bremen became the most important Passenger ports in Europe. Emigrants were registered in Hamburg since 1850. The passenger lists from Hamburg still exist; the ones from Bremen were destroyed. The industrialization and Germany’s production of coal and steel brought many people of the land into the cities. The import of cotton in conjunction with slave labor provided a cheaper product and wiped out the century-old profession of the weaver, who processed flax. Many people had to leave the profession and the life they once knew to find work in the cities. Poverty here was prevalent. People did not have cash to pay the church to get married, for instance. From 1800 to 1850 we see many illegitimate children. 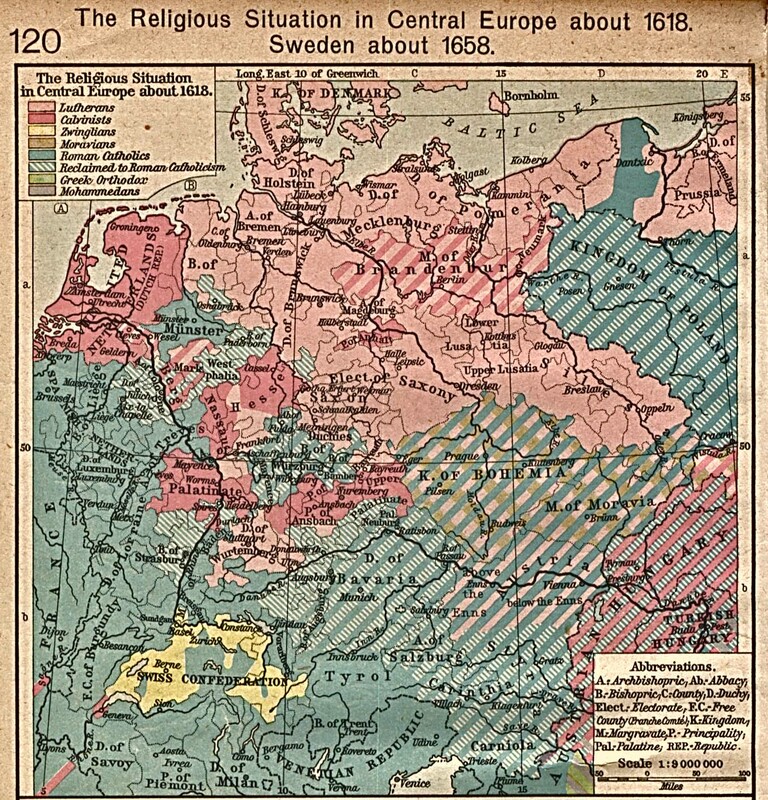 This map shows the territories Germany lost as a result of Word War I. After Word War II Germany lost the following territories. Historical Background Affecting Genealogical Research in Germany and Austria. Salt Lake City, Utah, USA: Genealogical Society of Utah, 1977. (FHL book 929.1 G286gs ser. C no. 19; fiche 6,000,035.) This work emphasizes religious minorities and emigration. Local histories describe the settlement of an area and the founding of churches, schools, and businesses in that area. They may contain information about families. Some county and town histories include separate sections or volumes containing biographical information. Even if your ancestor is not listed in a history, information on other relatives may be included and may provide important clues for finding the ancestor. A local history may also suggest other records to search. A special type of local history book with extensive genealogical information, called a village lineage book (Ortssippenbuch or Ortsfamilienbuch), is available for many towns in Germany. For more information about these books, see the “Genealogy” section. In addition, local histories should be studied and enjoyed for the background information they can provide about your ancestors' lifestyle and the community and environment in which they lived. The Family History Library has some local histories for towns in Germany, and similar histories are often available at major public and university libraries and archives. The Gregorian calendar is the calendar in common use in the world today. It is a correction of the Julian calendar that had been in use since A.D. 46. Leap years were miscalculated in the Julian calendar, so that by 1582 the calendar was ten days behind the solar year. 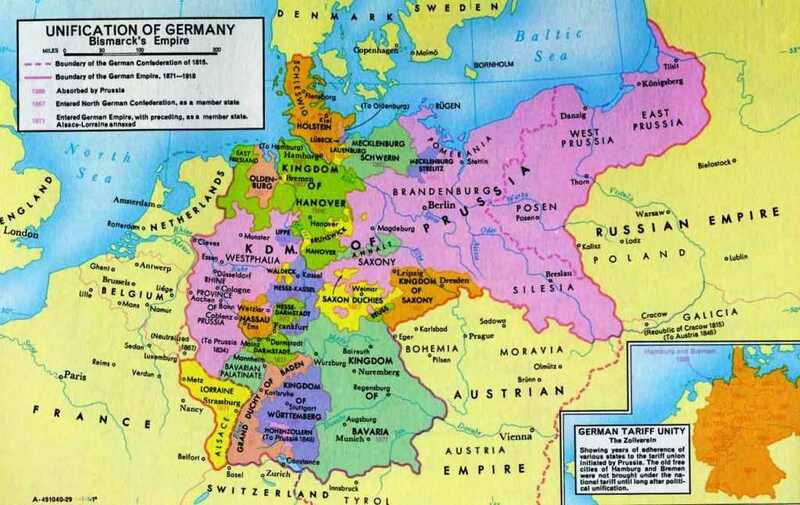 In 1582 Germany was a collection of small principalities, duchies, city-states, and feudal estates. The new calendar was officially adopted by the Catholic dioceses and states in Germany between 1582 and 1585, but many Protestant states did not accept the new calendar until the 1600s. As a result, there were two different dating systems used in various areas of Germany throughout this time period. In some cases, Catholic and Protestant congregations in the same city may have used different calendars at the same time. The Gregorian calendar was finally accepted throughout Germany in 1700, when the Protestant commission adopted the new calendar. In that year, 18 February was followed by 1 March. Feast Dates. Date calculation tables are available to convert church feast dates to days of the month (see “Feast Dates” under the “CHURCH RECORDS” section), but there are separate tables for calculating dates in Julian and in Gregorian years. It is, therefore, important to know the year in which the calendar changed in the area you are searching. You can find a list of over 30 German territories showing exactly when they officially shifted to the Gregorian calendar on pages 317 to 318 of Ribbe's Taschenbuch für Familiengeschichtsforschung. Individual parishes or villages in a region may have lagged behind the rest of the region in making the change. Double Dating. When an area changed from Julian to Gregorian calendars, the first day of the year changed to 1 January. Before the change, the first day of the year was 25 March. Pre-change dates may be confusing. For example, before the change, 24 March 1565 was followed by 25 March 1566. Many researchers record dates between 1 January and 24 March with two years, using a technique called double dating. An example of a pre-change date using double dating is 16 February 1573/1574. ↑ Carr, William. The Origins of the Wars of German Unification, pp89-143. London: Longman, 1991. This page was last modified on 26 June 2018, at 19:14.